Driving yesterday I heard an NPR story on WCAI, the Cape & The Islands (CAI) radio. They broadcast a show entitled “The Moth” which features audio storybooks of everyday Americans. Their first story really gripped me: an autobiography by Aimee Mullins, a young women who lost both of her legs at birth and has used prosthetic limbs ever since. Ms. Mullins told a truly amazing story about her life and her various opportunities to touch the lives of others. One was a little girl who also had an artificial limb. At the time Aimee first met her she had been struggling. Kind of ‘just’ getting along – setting no great expectations for herself while locked inside the world’s limited view of her capabilities. Aimee inspired her to re-frame her expectations for herself and for those around her. This week’s book, “Working Identity: Unconventional Strategies for Reinventing your Career,” by Herminia Ibarra winds a similar tale. The author challenges readers to re-frame the questions used to evaluate career choices all the while introducing a practical approach to transition. She addresses the often ignored “how” of changing careers in her book. While I wasn’t hanging on my chair to read it, I found many, many useful ideas that could benefit women in transition — any transition – career or otherwise. Her approach is refreshingly simple. Ibarra debunks the view that career change is realized after many introspective moments and a good plan. Rather she approaches it like one of my favorite IT transition planning techniques: the pilot – prove – proceed approach. Ibarra encourages readers to envision many possible future selves and to test each to see how they might fit. I guess you guys are part of an exploratory test on my part. You see I’ve often dreamed about being a social commentator. I’ve also always been very vocal about women’s issues. The net of it is this blog is exploratory for me; it has allowed me to unconsciously dedicate myself to exploration and to learn so much about that which I care deeply. Who knew? The little girl with the sparkly shoes had been locked inside other people’s perspective of what she could or should do. When challenged she changed the set of questions she asked herself. It took only a single encounter to initiate the change for Aimee Mullins’ little friend. I wonder what it may take for me or you? (c) 2011 NovoFemina.com – All rights reserved. No content on this site may be reused in any fashion without written permission from NovoFemina.com. 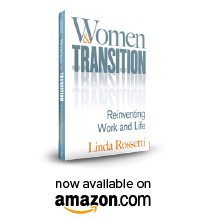 This entry was posted in "Transition" Book Reviews and tagged career choices, career transition, career transition issues, linda rossetti, observations from a women's transition, personal transition, women's issues, women's professional transition, women's transition issues. Bookmark the permalink.